The basic income movement is picking up momentum at an enormous rate, but even with past and present trials, many are still looking for further evidence of what would happen if a guaranteed income were provided over the long-term. So we’re planning to run what will likely be the largest long-term pilot of a basic income ever, and we have got some of the world’s leading economists on board to perform a rigorous evaluation. You can learn more and join the pilot here. For years, GiveDirectly has been providing short-term cash transfers to the extreme poor and seeing positive results — people do not stop working or drink it away, they invest in bettering their lives. If this basic income pilot shows similarly positive results, it could open the door to governments around the world beginning to adopt policies like basic income. But we need to move fast — the debate over basic income is happening now and people are shooting down the idea based on speculation. If we are going to provide evidence in time to effect this debate, we need to launch the pilot this year. We will guarantee thousands of individuals living in extreme poverty in East Africa a basic income for over ten years, but we will have results on impact — do people invest more, seek more education, become more creative? — within a year or two. Learn more about our project and, for just $1 per day, support the basic income of one person in poverty. At best, we will break through the impasse of the basic income debate with evidence that shapes our economic futures; and at worst, we will provide life-changing aid to some of the poorest people on the planet. We are teaming up with leading researcher Abhijit Banerjee from MIT and have calculated that we can run and study this pilot for $30 million, and we are willing to match the first $10 million donated. If just 5,000 people commit $1/day by this summer, we can make it happen. Join us: for just $1 per day, support the basic income of one person in poverty. This is the moment to launch this potentially historic pilot. Be a part and join now. At the home of Beatrice Achieng in Nduru Upper village. 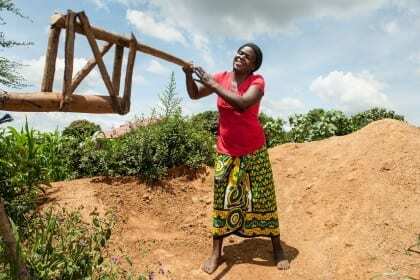 She used the cash transfer from Give Directly to dig a 30-foot borehole that now supplies her family with fresh water. She also build the foundation for a new house on her compound. Beatrice fetches water at the borehole. At the home of recipient Rispa Atieno Okoyo in Koga village on 22 October 2014. Rispa used the cash to build this goat pen, she bought 2 cows, and planted maize and beans. Rispa with her children in front of their house. At the home of recipient Gabriel Otieno Awoche in Koga village on 22 October 2014. Gabriel built a house and chicken coop with the cash. He also bought woodworking tools for his furniture workshop. Gabriel with his wife Lucy Adhiambo and their daughter Charlotte, 3. They also have another daughter, Mariam, age 1 1/2. This is absolutely a much needed initiative. I support this. It is important that not only is the social inequality in the world is reduced. It is the restoration of humanism and mutual understanding. It’s everybody’s land and it is our lot to share so there is enough for everyone – and it’s more than plenty. It is important to just philistine but all matter belief or conviction can come to terms freely. And that our leaders recognize that the majority must make room for all in society – I would say – especially if they are a minority. You can not put people in cubicles.